When Izler Solomon, conductor of the Indianapolis Symphony Orchestra, approached the Rockefeller Foundation in September 1965, he had in mind a foundation-supported project involving the orchestra and colleges and universities in the Indianapolis area. Solomon told Martin Bookspan, the foundation’s music consultant, that foundation support could add a week to the ISO concert season. The orchestra in turn would devote the week to publicly rehearsing and performing music by American composers, giving preference to works that had not been performed before in the Indianapolis area. This meeting was the genesis of Indiana State University’s Contemporary Music Festival, which celebrates its 53rd anniversary this year. Solomon’s proposal led to another meeting, when foundation officials met in New York with ISU Department of Music chairperson James Barnes, along with William Thomson and Wilfred Bain, theory chair and dean, respectively, of the Indiana University School of Music. The foundation agreed to make a grant to the Indiana State Symphony Society Inc. to fund premiere performances of symphonic works by American composers to be presented in Terre Haute and Bloomington. A nationwide advertisement called for scores that were screened by ISU music faculty members Sanford Watts and Jon Polifrone, further evaluated by Barnes, and turned over to Solomon for final selection. The result? The first Symposium of Contemporary American Music at Indiana State University—several open rehearsals and one orchestral concert—took place May 8-11, 1967, after a week of similar activities at Indiana University. Since then, the mission of the festival has grown to give students a glimpse of the lives of professional composers, performers, critics, and scholars; to promote the work of young American composers; and to generate public interest in modern music. It stands alone among other contemporary music festivals by emphasizing symphonic music and featuring a major professional orchestra. Over the last fifty-three years, the festival has featured numerous nationally and internationally known performers, conductors, and composers. Eighteen of them now have the Pulitzer Prize for Music, and five have received the Grawemeyer Award. Some of them were guests of the festival several years before they received these awards. Festival planners built into the program lectures, symposia, open rehearsals, and social events to foster interaction between the visiting musicians and the public. An annual competition for orchestral compositions, part of the festival since its inception, has provided many young composers with the invaluable experience of hearing their works rehearsed and performed by a professional orchestra. After the festival’s first two years, however, foundation support ceased. 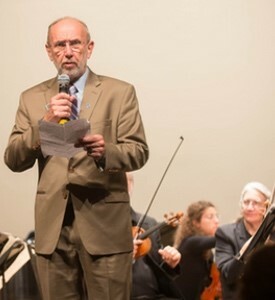 ISU President Alan Rankin, a musician himself, saw not only the artistic value of the event but also the prestige it had brought to the institution and allocated university funds to keep the festival going. In 1971, under the leadership of ISU percussionist Neil Fluegel, the format of the festival underwent major changes. One well-established composer—that year it was Michael Colgrass, who would win the Pulitzer in 1978—was invited to participate with the competition winners. A solo and chamber ensemble concert by faculty and students, featuring the chamber music of the participating composers, was added. The daytime event schedule was expanded as orchestra section leaders held master classes, and the principal guest composer led a composition seminar. The additions have been preserved, with some changes, since that time. Newspaper reports of the first few festivals describe a fairly conventional event, but coverage of the 1971 festival indicated a new underlying political agenda: a break with traditional Western culture. Events included a modern-dance workshop, a seminar in multimedia composition, and a synthesizer demonstration. “Music to the People,” the title of the special festival edition of the ISU student newspaper, mirrored the anti-elitism that had begun to pervade higher education. The idea that art music could be relevant to youth was reflected by concert programs and newspaper articles equating these young, longhaired composers in blue jeans with the iconoclastic masters of the century’s earlier years. Now the emphasis was on student involvement: performing, composing, and participating in panel discussions. They no longer just observed musicians and composers as role models on a stage or in front of a class, but interacted with them at their instruments, at the lunch table, or on the softball field. The 1972 festival died in a strike by Indianapolis Symphony Orchestra union musicians, but in 1973 the festival continued to move in new directions. Over the next several years, the musical emphasis was on experimental composition and performance techniques of the late-twentieth century. In the first three festivals, only one composition—Charles Wuorinen’s Orchestral and Electronic Exchanges (1967)—included non-orchestral elements. But electronic and synthesized music soon became an annual component of the festival. Atonality, twelve-tone and total serialism, multimedia, and aleatoric compositional methods were represented, as were the influences of ethnic musical styles, jazz, and rock. Some representative guest composers were David Cope, Ross Lee Finney, and Will Gay Bottje. Nonstandard notation became commonplace. Slides, films, and other visual elements were introduced. 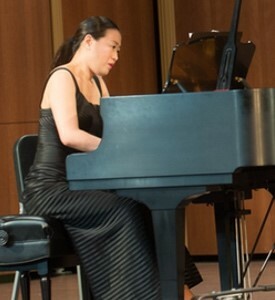 Altered instruments (such as prepared piano) and unfamiliar techniques (such as plucked or bowed piano) were used. Much attention was given to world premiere pieces. The festival clearly reflected the “do your own thing” era. For several years, many were attracted to the novelty of the festival. But public tastes change with time, and the inflation of the late-1970s made it increasingly difficult to keep up with festival expenses. The culminating orchestral concert was made a part of the university’s Convocation Series. Neo-Romantic principal guest composers—such as Ned Rorem, George Rochberg, and William Bolcom—spoke frankly of their desire to communicate with their audience. Selection of chamber ensembles began to favor nationally known groups over regionally recognized ones. Music critics from major publications were invited and led student writing seminars. Faculty began to require students to attend the festival and, often, to write related class papers. The Louisville Orchestra, which made its reputation in the 1950s for commissioning and performing contemporary music, began participating in 1987. Some of the social changes of the previous decades, however, began to leave their mark: women composers like Joan Tower and Ellen Taaffe Zwilich began to be integrated into the festival, and members of the Kronos Quartet preferred T-shirts and leather jackets to formal wear. During the 1980s, festival planners had to do more with less, and over the decade they reduced the number of competition winners to one, returned to the single orchestral concert format, and condensed the festival from four days to three. Getting funding for the festival was a continuing struggle, and several times the future of the festival was in doubt. However, overwhelming support from the music faculty, growing audience interest, and increasing national recognition of the respect for the festival persuaded the university administration to provide the means for it to continue. Although public funding for many projects was cut drastically during the period, the festival was beginning to receive grants from government and corporate sources. The introduction of the Indianapolis Chamber Orchestra as the festival’s guest orchestra in 2007 helped to reestablish its connection to Indiana’s outstanding arts organizations. In fact, the 2007 festival featured an all-Indiana cast, including the guest composer, the composition winner, the guest orchestra, and the guest chamber ensemble. While the principal guests may change, however, the primary goal of the festival remains true to its roots - to introduce students to the everyday work of professional musicians and to present new music to the public. No one can predict the result of the synthesis of these ideas. But one thing is certain: if art music of any style is to remain alive, it must continue to grow. 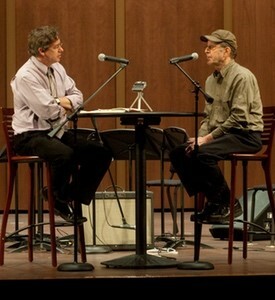 Indiana State University’s Contemporary Music Festival is one event that encourages that growth. It is to be hoped that universities everywhere will persevere in such encouragement for the enrichment of our culture and our lives.